With complimentary amenities like daily breakfasts, dinners (Monday-Thursday) and WiFi access, the Arena Hotel is a fabulous value for guests who want to be close to all the action in San Jose without breaking their banks. The spacious guestrooms feature an array of modern comforts, such as refrigerators, microwaves, two-person Jacuzzi tubs and telephones with voicemail, and guests can enjoy access to laundry facilities and beautiful indoor and outdoor sitting areas. Located on the west end of downtown San Jose, the Arena Hotel is only minutes from the airport, the corporate offices of major Silicon Valley businesses and the area's robust restaurant and entertainment scene. When staying in a vibrant city like San Jose, it's important to not only be located close to all of the city's hotspots, but also to be in a hotel that will be a quiet oasis to return to when you've had your fill of playing. With quiet, comfortable rooms and a great location, the Arena Hotel offers guests the chance to enjoy the best of both worlds. Downtown San Jose is filled with things to do; from hockey games to museum exhibits to pulsing nightclubs. Travelers can delve into the robust arts scene by visiting the San Jose Museum of Modern Art, taking in fabulous theatrical productions at American Musical Theater, enjoying world-class opera at the intimate California Theater or simply by wandering from art gallery to art gallery. There are also dozens of historical sites and buildings throughout, as well as renowned monuments and memorials. Families will love visiting places like the Tech Museum and the Children's Discovery Museum, which are as much fun for grown-ups as they are for kids. Hockey, Concert Tickets, Lacrosse and More! This downtown San Jose hotel is also only two blocks from the HP Pavilion, home of the San Jose Sharks and host of myriad concerts and events, making it ideal for lodging after concerts or major games. Sharks games draw tons of visitors to downtown San Jose, making parking hard and traveling even harder, so being walking distance from the “Shark Tank” is one of the Arena Hotel's major perks. This area of town also gets packed when major performers come to town. Concerts of every ilk are hosted here, from jazz shows to metal shows to hip hop and R&B. Concerts on the schedule for 2008 include Michael Buble, Kanye West, George Michael, Alicia Keys and Celine Dion. In addition to major hockey games, HP Pavillion also hosts many other sporting events. American Metal & Iron Fight Night at the Tank is one of hottest boxing events around, arena football giants the SaberCats pack the stadium regularly, and professional lacrosse team San Jose Stealth will bring even the quietest fan to standing and cheering. The second oldest tennis tournament in the U.S., the SAP Open, is also held annually in San Jose at the HP Pavilion. Complimentary breakfast: Weekdays from 6:30–9:30 a.m. / Weekends from 7:30–10 a.m. 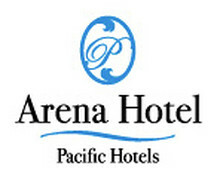 The Arena Hotel is located in a charming district in Downtown San Jose.